I like to imagine what may be on the menu for the human carers living there. Perhaps some hearty Pasta el Fagioli followed by some bussolai buranelli pastries collected from the island of Murano earlier that day. And the freshest of sardines for the kitties after a trip to the markets for that sole purrpose, of course. Meow. so is this drawing (purrfect, that is). Love it! I'm curious: Did you do your Venice paintings on the spot, sketch them there & finish them later, work from photos? Do you carry a sketchpad everywhere, like some of us carry a camera? Haha Shell - my kitties love sardines. Love the little one in the doorway and the window beyond ... beautiful. Alexa ~ All from photos, though sketching en plein air is much more romantic. :) I love drawing and painting in my little studio. But I've started carrying a watercolour pad with me too. 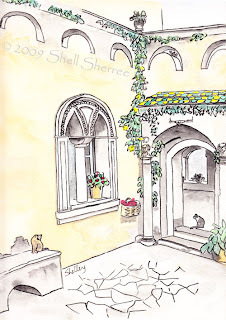 That is a fantasy courtyard and the kitties are lucky to live in such beautiful surroundings. from cali ~ yes, I'm guessing they had a pretty charmed life! Such spoiled kitties, Alexa! As rock star cats should be. Shell, I'm charmed and hungry all at the same time. Petrea ~ 'rock star cats' - I love it! Petrea—me too (and were they ever)! Although my cat is ...in fact...used to be a male, he really acts like a diva !! Nice drawing, as usual, thank you for our dose of Venice. Marylène ~ I guess your diva would have appreciated such surrounds too! Another beautiful drawing, Shell. I do believe those cats live a fancier life than I. Sigh. I really like this one, Shell. Love the pale yellow and the little dash of rose. Margaret ~ thank you! I love the way those pigments weather.